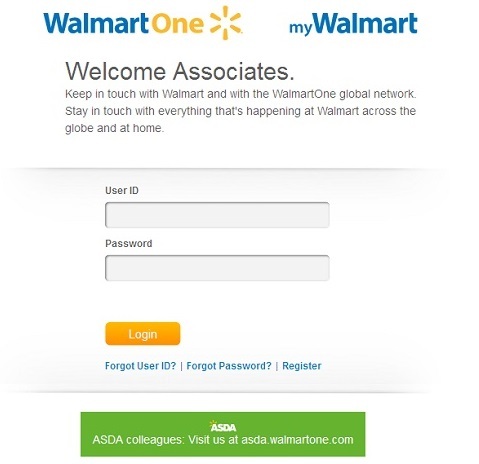 The complete online guide to the WalmartOne Associate Portal, the Walmart Wire Employee Portal, and HR Department contacts. If you have lost your WalmartOne password, Walmart User ID or is having trouble logging in/signing in to the Walmart Associate Portal, then we can help. WalmartOne (or Walmart1) is the official name of the employee/associate portal for Walmart workers. At WalmartOne, you can check your weekly work schedule, view your Walmart paystubs, see benefits information, and apply for holidays and days off (PTO). You will need a WalmartOne Login in order to access the WalmartOne portal. Ask your manager for your Walmart IdentificationNumber (WIN), if you have not yet received it. You will need this number to register. You must have your WalmartOne Login details ready when accessing the WalmartOne portal. Walmart Wire, by contrast, is the work based employee prortal, that you can log into at yout Walmart work location. You cannot sign in to Walmart Wire from home. Thye company is working on integrating/merger the WalmartOne and Walmart Wire portals in to one waccessible website, which will probably happen later this year. The official login page can be found at https://authn.walmartone.com/login.aspx. If you alrady know your user ID and password, then you can just proceed with entering them and login. If you do not yet have WalmartOne user ID and WalmartOne password, then click on the “Register” link. How to Register at WalmartOne. Submit this information and you will receive an e-mail with your WalmartOne login information. You can use the WalmartOne app to view your paystubs and schedule from your mobile device. Simply download the app though the links below. iOS app is available at iTunes. Android app is available at Google Play. WalmartOne PTO (Paid Time Off). PTO gives employees control over your time off, and flexibility in how you choose to use it. With PTO, you can plan ahead for holidays or family events. And if you don’t use it all, at the end of the Plan Year, an employees extra PTO will turn into cash. Walmart Associates earn PTO hours based on your job status, how long you’ve been with Walmart and the number of service hours you’ve logged. You can see the time off you’ve earned each pay period, and you can use your PTO as soon as you earn it. Only way to check the PTO time is on the GTA Portal on the wire. Also, your PTO time, and any other time such as Personal will show up on your paystub too. Read more about PTO here. Answer: Go to the WalmartOne login page and click on ‘Forgot Password?’. Your user name can be emailed to you if you request it, or you reset your password simply by answering the security questions that you have entered when you registered. I want to speak to the WalmartOne HR Help Department. What is the phone number? Answer: The WalmartOne support team is available at 1-800-530-9929 . Press options 2 then 2, when you are through. Walmartone.com Login Help and FAQ. Share your experiences with WalmartOne, WM1 App, Walmart Wire below. I have an account with Walmart One but when I try to login it says that my user ID is incorrect. When I put my email address in it also says its incorrect. Can you help me with this? Answer: First try from another browser or device. I you forget your user name then go to the login page and click the appropriate link. Request that your user name should be emailed to you. If you cannot access your email, then call the service team at (800) 530-9929 Option 2,2. A: The information that is entered doesn’t match what’s in our system. If you believe that the information that you are entering is correct, please contact your Personnel Manager or HR Representative to verify. I called today to have old acct closed due to old info I had no access to. I keep trying to register with new user ID and pass but I get to entering the password and it keeps telling me OOPS!!!!!!????? Having trouble seeing my schedule at my home office. It comes up as a server error. Everything else however works fine. When I click in the user id box it doesn’t give me the flashing line to enter my user id so I can’t type anything in the box. Loved Ones”, I find it very difficult to navigate through the multiple interfaces and also third party walmart “Advocates”. I am an associate at walmart and I depend on the services to be accessible in order to fully receive the benefits that I work for. Please Respond As Soon As Possible.